2 What Causes Acne on Chin? Our skin reflects what’s going on inside our body. Acne on any part of the face is really painful. No one likes those small red colored lumps on their face because it looks ugly. It also makes us feel uncomfortable around others and also destroys our confidence. Acne affects both men and women. This problem affects people of all ages, especially those aged from 15-35 years. 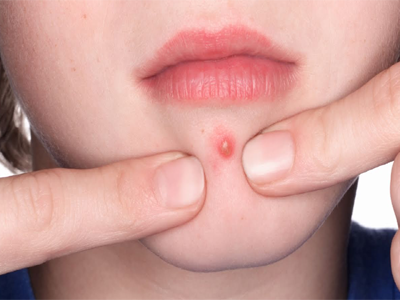 Chin is the first spot for big, painful pimples which continues to pop up again and again and seem to multiply overnight. Mostly, girls are affected by this Acne under chin because of hormonal shifts and imbalances in the body. Hence, go through the article for the chin acne causes, treatment for the Acne on chin and Jawline. Adult acne is a common skin condition. Acne on any part of the face can look awkward and uncomfortable. If you get pimples on the chin or cheek or jaws, you try to hide it with makeup as much as possible. Depending on the circumstances, a woman may develop significant amounts of this type of acne on the chin, as well as other areas on the lower face such as the jawline and skin surfaces near the mouth. Acne on chin has various meanings as far as your hormones, growth factors, and general health are concerned. Having breakouts of acne on the chin, cheeks, jawline can be related to many things about your overall health. But you can decrease the effect by getting adequate sleep, drinking enough water, eating leafy veggies, and keeping skin clean. There are no specific skin care products for chin acne. You may use the same product you use on the rest of your face for treatment of acne on your chin. What Causes Acne on Chin? Pimples or Zits occurs when a pore in the skin gets clogged, usually with dead skin cells. Sometimes bacteria may get trapped inside the pore, thereby causing the area to become red and swollen. Managing and treating acne on chin including cystic chin acne is hectic and tricky. Why do I have Cystic acne on chin? What causes Chin acne? are the common questions that rise to our mind when pimples appear on our face. We were probably searching for the Acne on chin causes on the internet. Here I have mentioned some of the general causes of Adult Chin acne. Generally, the most common causes of acne under chin in adults revolves around their diets, stress, and hormonal changes. Unlike teens, adults will also tend to have zits on their neck, chin, and jawline. But in the rare case only, pimples appear on the cheeks or temples. One of the leading causes of the Acne on Chin is Hormonal Imbalance. Hormones stimulate oil production, which develops acne causing bacteria to grow and encourage the pores to become clogged. In adult women, an imbalance in hormones occurs which means that the androgen receptors become too sensitive. Under this situation, hormones were stimulated, and excess oil (sebum) is produced. The surplus oil is discharged through the skin pores in which the skin cells become sticky. Bacteria will grow in the skin pores which forms clogged pores and Pimples on chin thereby developing the Hormonal Chin Acne. Women tend to break out these zits or pimples on the lower third of the face, particularly the jawline and chin, but the neck may also be involved. Can Bacteria & Poor Hygiene cause Acne on Chin? 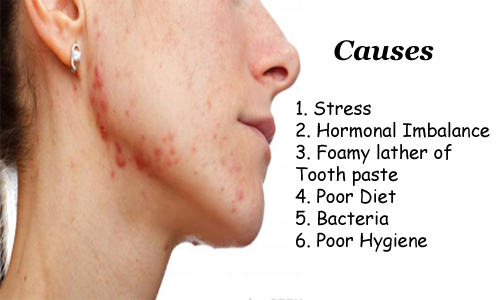 Of course, Bacteria and Poor Hygiene causes cystic acne on chin. Most of the bacteria grow in dirty conditions and surroundings. It is important to note that there exist free-living strains of bacteria some of which cause infections. Careless sharing and handling of devices such as mobile phones, musical instruments, facial makeup and other beauty products such as lip balms with contaminated hands also causes the acne on chin. You should not touch your chin, face or neck with the dirty hands. Since it can spread the dirt, bacteria, and oils on our skin and causes pimples on chin. Stress can trigger an acne breakout in adults. It has also been reported that people with acne due to hormonal changes and who live with stress may worsen it. Regular stress such as career or family or social life is enough to cause chin acne. During pregnancy, women can get high levels of a stress hormone called cortisol. It will increase the secretion of sebum and thus chances of getting zits on chin mouth area. When an excess of sebum is produced, it may lead to blockages thereby causing chin and jaw acne. Dairy products are mucous-forming foods and are difficult to digest for our body digest. That’s why most of the people are lactose intolerant. So when you get too much dairy for your body to digest, it comes out in the form of cystic acne on the chin and jawline area. Fortunately, there are a plenty of treatments available to reduce or eliminate under chin acne and other forms of adult acne. A single pimple on chin may multiply to a number of others if the infection spreads with time. Therefore, take care of your skin from the beginning by using these Natural Acne treatments. When I saw acne on my chin, I will be probably searching for How to get rid of Chin Acne Naturally? What is the best acne treatment at home? In the same way, you will also raise questions to yourselves. Remember, these Home Remedies for Pimples can take some time to work. Don’t get discouraged and don’t give up yourselves too soon. Just, follow these Self-care steps at your home for a pimple under chin treatment. Cloves help you to get rid of cystic acne on chin. You can use this spice or use the Clove oil for the acne treatment. Boil some cloves in water. Let it cool and crush the cloves into a fine paste. Now, apply the paste on the affected areas. Leave it on the face for 15-20 minutes. Finally, clean with cold water. The Sandalwood powder is the best natural acne treatment. Because it can treat numerous skin diseases like acne, pimples, dark spots, dark circles, after marks, etc. Mix sandalwood powder with yogurt and besan. Add some drops of lemon juice. Stir them to get a fine paste. Now apply this face pack on your chin or all over the face. First of all, detach the yolk from the egg white and keep it separately. Now apply the egg white on the pimples with your fingers firmly. In the morning, wash it off with slightly warm water. Potatoes consist of sulfur, potassium, phosphorus, and chloride which helps to reduce acne under chin and the blemishes. Wash your face with water and pat almost dry. Now rub the pulp and juice onto your face in a circular motion. Let it dry for about 15-30 minutes. Finally, rinse it off completely with warm water. A complete guide to Get Rid of Acne Naturally? We know that mild and severe acne are two major types of the acne on chin. If your acne on chin is a mild one then some oral topical antibiotics or creams and drugs can be used. In particular, the drugs that have retinoid can work best for the acne under chin. On the other hand, if your case is severe, the best treatment for adult chin acne is isotretinoin. The women who have already conceived or planning to get pregnant must avoid this drug. 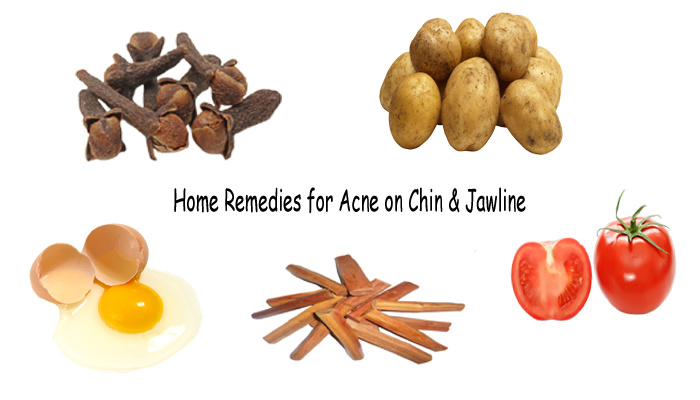 If you don’t find any improvements with these home remedies for pimples on chin, then visit your dermatologist for a course of oral antibiotics. But remember that it is just a temporary solution, and there is no way to dismiss the acne forever. All you can do with these medications is reducing the breakouts. There are some over-the-counter (OTC) acne medications available to treat the acne cyst on chin. Salicylic acid: The Salicylic acid is also known as beta-hydroxy acid. It works by peeling gently to unclog pores. It is present in a variety of OTC cleansers and spot treatments, and also gentle enough to use on the whole face. Benzoyl peroxide: BPO works by killing the acne bacteria and also exfoliating the pores at the same time. It is not so gentle and can make your skin really dry and irritated if you use too much. Glycolic Acid: It is an exfoliating ingredient and also an alpha-hydroxy acid that targets both acne and wrinkles at the same time. Glycolic acid helps in improving the skin’s texture, reduce fine lines, wrinkles, and also clears the acne breakouts. Retinol: Since it is a vitamin A derivative, our skin absorbs and converts it to retinoic acid. Retin-A is the prescription form of Retinol. The biggest drawback of this is they are harsh and can also sometimes be too much for sensitive skin.